Every night at 6:45 pm Open 7 days / 7. Special evening on December 31. Today, the Moulin Rouge and its 60 artistes present the Féerie revue show: two hours of amazement between cabaret and music hall styles where dance scenes and surprise acts intersperse. 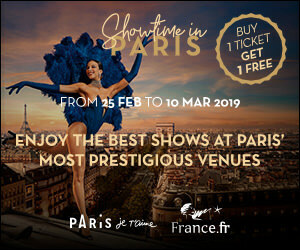 The show takes us from the sleepy garden of the Moulin Rouge to the decks of a pirate ship in Indonesia, then back to town with a travelling circus, before dipping into nostalgia with a portrait of Paris through the ages… and not forgetting the Moulin Rouge’s most emblematic dance, the French Cancan! Every evening, a fantasy world bursts onto the stage: 1000 costumes shimmering with feathers, rhinestones and sequins, sensational performances, sumptuous sets and original French music. The Moulin Rouge offers its guests a Dinner-and-Show experience, starting with a sophisticated dinner to be savoured against the melodic backdrop of live tunes played by the musicians. Composed by Chef David Le Quellec, the restaurant menu boasts a new take on traditional French dishes changing with the seasons, cooked using local produce and lovingly prepared in the kitchens of the Moulin Rouge. Amidst the warm and joyful atmosphere of a venue decorated with unexpected details inspired by various eras and stories of the theatre since 1889, the Moulin Rouge invites us to live and share all the emotions and effervescence of a unique party extravaganza! Open 7 days / 7. Special evening on December 31.